This brown rice porridge recipe is creamy, dairy free, and will have your taste buds asking for more! 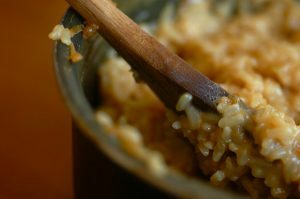 Brown Rice Porridge is a healthy alternative for rice pudding and is a great source of fiber and magnesium. It is thought that the high selenium levels, as well as certain phenols found in brown rice, are associated with reduced risk of colon cancer. These phenols are present in much higher concentrations in brown rice than in white. Almond milk is a great alternative to dairy and is low in fat, but high in energy, proteins, lipids and fiber. It contains minerals like calcium, iron, magnesium, phosphorus, potassium, sodium, and zinc. The other nutrients available in this milk include vitamins such as vitamin C, vitamin B6, thiamine, riboflavin, niacin, folate and vitamin E. All these nutrients have various benefits which are essential for a healthy body. Honey is a wonderful sweetened in moderation and is naturally antibacterial and anti-inflammatory. Fight cancer in the kitchen with this rich and filling dessert or breakfast! 1. Rinse brown rice in cold water. 2. Add rice, milk, vanilla, and salt to a medium saucepan over medium-high heat. 3. Bring to a boil, reduce heat, and simmer, stirring occasionally, until tender and the mixture resembles a soft pudding, about 35 to 45 minutes. 1. Meanwhile, toss together the blueberries, honey, lemon, and salt in a baking sheet and roast 15 minutes until the blueberries release their juices. 2. Divide porridge between bowls, stir in honey to taste, and top with roasted blueberries.